Shutter padlocks are also known as block locks, warehouse padlocks, straight shackle padlocks and so forth. Traditionally they are made from solid brass or hardened steel but that makes them quite expensive. 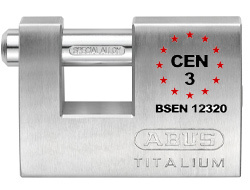 ABUS have now released this model in an alloy of aluminium and titanium but still with the hardened steel shackle or bar! Fundamentally it remains similar in security to it's more expensive sisters and excellent in terms a security / cost trade off. Note that you can use a chain with this lock even though the gap is small. You simply put one of the end links through the other, and then attach only a single chain link to the actual padlock. Please be aware that the key entry and shackle extrusion are on opposite sides which can prove problematic if using this lock with limited space e.g a container lock with an enclosure. The ABUS 92 series have keyway and shackle extrusion on the same side. Each lock comes with two keys each. They are not special restricted keys and you can have additional copies made locally if necessary. 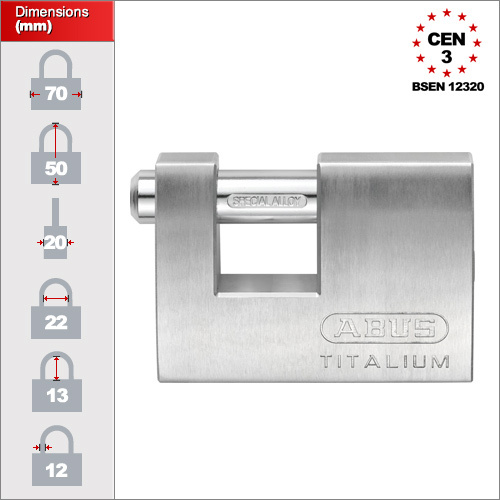 Technically speaking this lock is too new to have gone through the CEN testing standards at present but it meets the same specifications as the other shutter locks by ABUS which meet the CEN3 guidelines. As such we are happy to say that it meets these guidelines.